Karate for kids is about learning to defend yourself–but it is not the only benefit you will get from the study of Karate. Here are just eight of the many benefits you can expect to receive from Karate. Your confidence will improve as you start to master the kicks, blocks, and punches your instructor teaches you. Bullies will be less likely to bother you because they will sense your self confidence. You will feel better about yourself. Self-assured children are more likely to resist peer pressure, and are less likely to get into trouble. You will learn how to reach your goals. As you work toward each new belt, stripe, or badge, you will learn that you can obtain anything if you are patient and work hard enough. See Sensei Matt’s post about the meaning of the karate belts. You will improve your concentration. A good instructor will show you how to focus on what you are doing, which will also help you in school. The drills, games and exercises you do in Karate will really improve your coordination and balance. Many karate students become ambidextrous, which means they can use both sides of their bodies equally well. Coordination and balance will help you in other sports as well. You will make friends with other karate kids. You will find you have a lot in common with your classmates, as you all train together. You will become a better person. Your instructor will teach you very important things like respect for others, courtesy, and avoiding violence. You will become fit and healthy. It is better than sitting in front of the TV or computer. It is healthier for you to run, jump, kick, and yell. This will help you sleep better too. You will have a lot of fun. You will learn many new things, burn off a lot of energy, play Karate games, and hang out with other kids. Overall, karate for kids will make you a better person in every way and your self confidence will shine through. 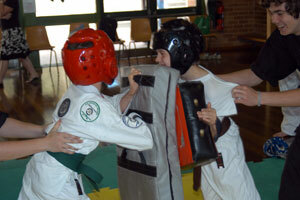 Please see Sensei Matt’s post on how martial arts schools build childrens confidence.